Eat Drink And Be Me: Miguel's - Just Can't Get Enough! Miguel's - Just Can't Get Enough! 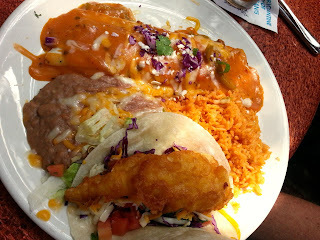 My husband and I bookended our trip to Coronado, CA by eating at Miguel's. It was the only restaurant where we ate while we were there. It's just that good! 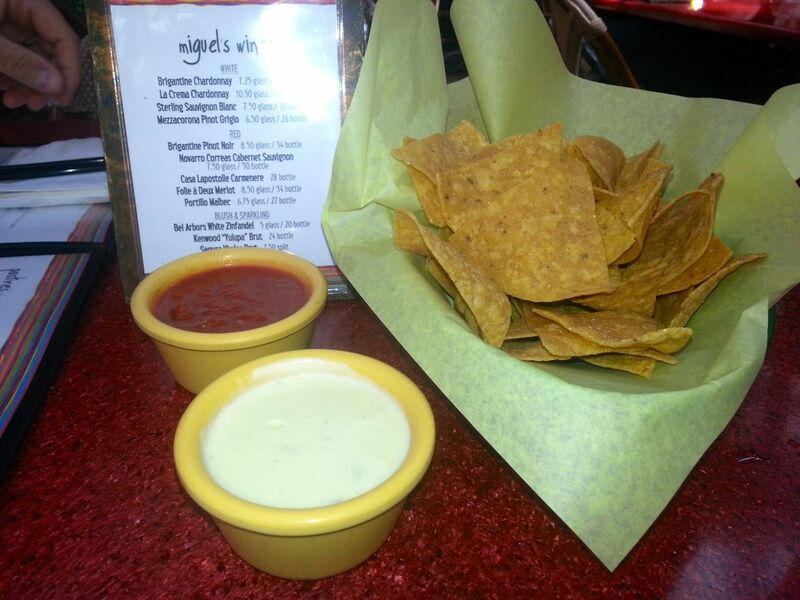 To read about the visit to Miguel's when we first arrived, you can click here. Of course the chips and jalapeno white sauce were incredible. We tried not to overdo it on those since we wanted to be hungry enough for our food. We had considered going there and just ordering drinks and dessert. We figured that along with the chips and white sauce, that'd be all we need. However, once we got there, we wanted to order entrees. We started with our drink order. My husband ordered Miguel's Mango-Mint Tea. 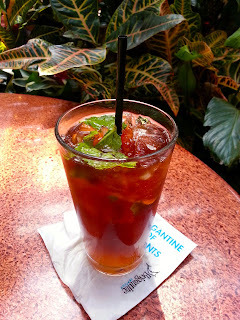 It was iced tea with mango syrup and fresh mint. It had a light mango flavor, but we both decided that we liked the Passion Fruit Iced Tea (which my husband had ordered last time) better. 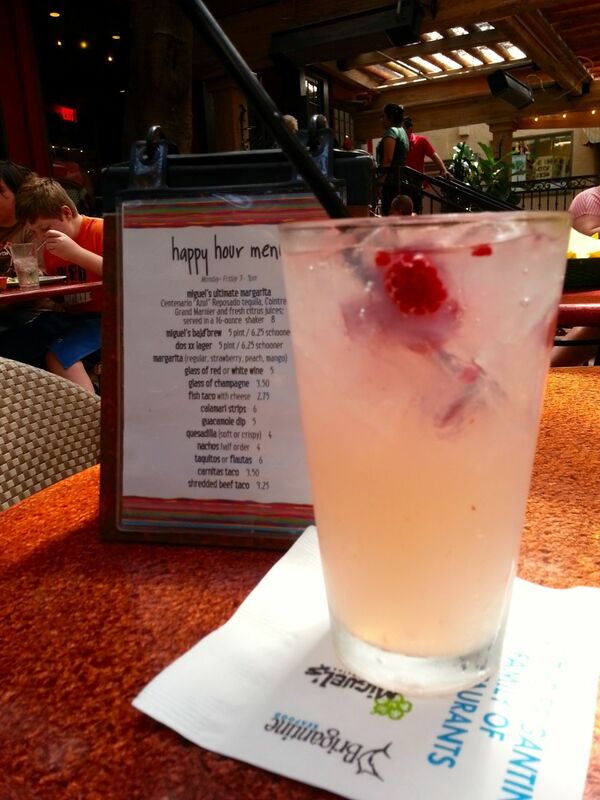 I decided to try the Pacific Breeze Cooler which contained raspberry vodka, lemonade, a splash of soda and raspberry garnish. I was worried that it was going to be too sweet or too strong, but I really liked it. Some people would probably call it watered down (it came in a glass with a lot of ice), but I thought it was refreshing and a nice light drink for a summer lunch. I liked it better than the Sangria (which I had last time), and I would definitely order it again. On to our entrees. My husband ordered Combo #4 which comes with a chicken burrito and your choice of either a chicken, beef or fish taco. He went with the fish taco. It usually comes with a corn tortilla, but he requested a flour tortilla instead, and they granted that request no problem. We both prefer flour tortillas unless the tortilla is fried. The fish was fried. I didn't taste it, but it looked really good. The burrito looked like a large enchilada, so it was smaller than if you just ordered a burrito. It was covered with cheese and ranchero sauce. The meal also came with rice and beans. One thing I particularly like about the burritos at Miguel's is that they only contain meat. Some restaurants use rice and beans for filler and hardly include any meat. My husband's only comment for improvement was that he'd like cheese inside the burrito instead of just on top of it. I ordered the Fiesta Salad. If you read my post about eating at Miguel's earlier in the week (which you can read by clicking here), you know how much I liked the Seafood Fiesta Salad. That special was no longer available this time, so I went with the regular Fiesta Salad with carne asada. I also requested to have the chipotle ranch dressing on the side. 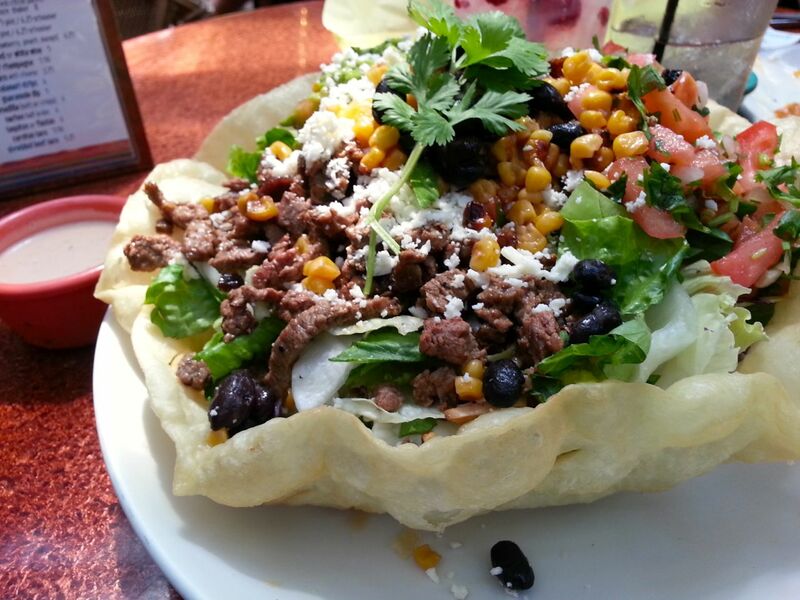 The salad came in a huge tostada shell, which I hardly touched. I prefer the salty chips to the greasy shell, but the shell is nice for presentation. It was loaded with mixed greens, black beans, and roasted corn. It was topped with carne asada, salsa fresca and guacamole. I gave most of the guac to my husband. I think guac's okay. He thinks it's great. I loved how the juice from the meat added flavor to the entire salad. I didn't even use the dressing. I tasted it, and it's good, but the salad didn't need any additional flavor. It tasted so fresh and delicious. I think this salad is going to be my new usual. You can call it getting stuck in a rut if you want to, but once I find something I love at a restaurant, I tend to stick with it. We were too full for dessert. The Mini Chimis will have to wait until the next time we visit Coronado, which will be in about a month. I can't wait!